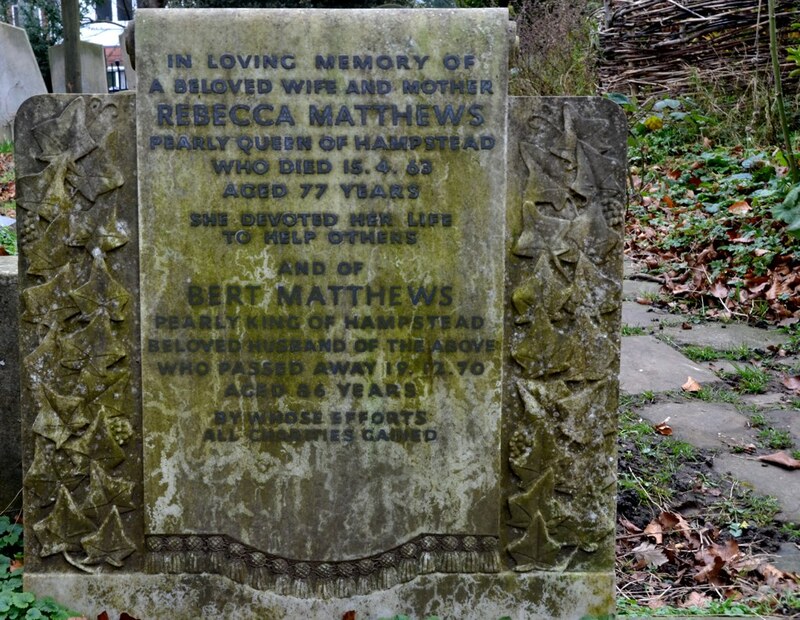 Bert Matthews was the rat-catcher for Hampstead for over 40 years. He and his wife Rebecca were the Pearly King and Queen of Hampstead, raising large sums of money for charity. Through their activities they became quite famous. In 1952 Bert and Becky were asked to go to America, where they travelled around in two red London buses encouraging visitors to come to the Festival of Britain. By 1891 James Snr was working as a labourer for the parish council and Emma was a laundress. They lived at 3AWhite Bear Lane, a house with fewer than 5 rooms, with their three youngest children. Frank was an errand boy and the other two, Lizzie and Bert, went to school at Hampstead Parochial. Here Bert met Rebecca (Becky) Cooke (born in the same year as Bert), who later became his wife. By 1901 James and Emma’s eldest son Walter had returned to live at home. It must have been very crowded. Walter and his brother Frank were working as labourers, and Bert was now an errand boy. Also living with them was their grandson, Alfred, who was aged 12. 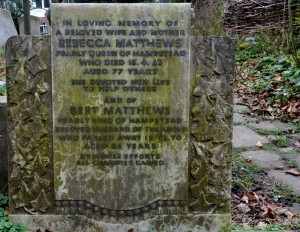 Bert and Rebecca (Becky) got married in the autumn of 1905 at Hampstead Parish Church. Bert’s father James died in 1909, aged 62, and Bert started working for the council in the same year, aged 25. By 1911 Bert and Becky (who was a laundress) were living at 1 Perrins Court, Hampstead, near the High Street, with his widowed mother Emma (63) and a nephew, Alfred (aged 22, now working as a milk carrier). The house was described in the census as having 5 rooms – not very big for a growing family. Bert and Becky had three children in that house – Ted (b 1908), Rose (b 1911), and Elsie (b 1915). In 1929 Bert and Becky still lived at 1 Perrins Court, a small alley off Hampstead High Street. This painting in the Museum of London shows what it looked like in 1931. At the time of his retirement in 1949 Bert and Becky lived in Flask Walk. He continued to sell shellfish outside the Flask pub while his son Ted sold them outside Jack Straw’s Castle. Bert and Becky moved to New End flats in about 1961. Becky died in 1963, aged 77, at New End hospital and her funeral was atHampsteadParishChurch. Bert died in 1970 (aged 86). Although Bert’s job was described in council records as a labourer he was actually a rat-catcher, keeping vermin under control throughout the old borough of Hampstead. Although he sometimes used bait to poison the rats he preferred to use ferrets; he kept a number in his backyard which he fed on bread and milk. His daughter Rose told the newspaper a story about her father’s work experience. One day he was called in to clear a house inHeath Street. When he had finished the butler refused to pay him what was owed for his services. So he said “alright, mate, have it your way”, opened the sackful of live rats that he had just caught and let them loose in the hallway! Bert retired from the council in 1949 after 40 years of service, during which time he had had charge of up to 8 other rat-catchers. 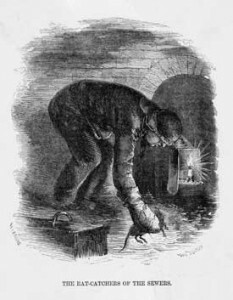 He was literally the last rat catcher of Hampstead; after his retirement his successors were called “rodent operatives” (earning £5/ 19/ – a week in 1949). Bert got involved in collecting money for charities in November 1902 (aged 18), when he and Becky won a fancy dress competition on Bonfire night on the Heath as part of the annual Hampstead carnival. They became the Pearly King and Queen of Hampstead, and their pearly charity activities made them famous. But it was also hard work – sewing on the pearly buttons, and making the first costumes for her children – the first Pearly Prince and Princesses – kept Becky busy every evening when she wasn’t working. A Pathe News clip in 1948shows the three generations of the Matthews family at their home in Flask Walk. They also went to Hollandto raise funds for the late Queen Wilhelmina’s cancer campaign. And, in 1953, probably because of their charity activities, they were invited to attend the Coronation of Queen Elizabeth II at Westminster Abbey. When Becky died in 1963 her obituary in the Ham and High noted that she had spent over 50 years raising money for charities and devoted her life to helping others. This Getty Images clip from 1968 shows Bert in his Pearly finery enjoying a pint near the end of his life. He died in 1970, aged 86. After his death his children (Ted, Rose and Elsie) and then his grandchildren (Linda, Brenda and Peter) took over as Pearly King and Queen and continued raising money for charities. Along with other Pearlies, Bert and Becky took part in the 1946 film “London Town” with Arthur Askey and Petula Clark (see this clip on YouTube). Bert also took part in a BBC radio programme called People Today in 1960, and was the subject of a “This is Your Life” programme on BBC TV in January 1964 (Season 9). In this programme, various celebrities and charities came on to thank him for his charity work.